The Old Town Hall of Bonn is an iconic landmark of the city. It has hosted important political events attended by powerful world leaders. Situated in the bustling three-cornered market place called “Markt”, the building is a spectacular reflection of rococo architecture. All l crown heads and state leaders are received at the Old town Hall with their names etched in the Golden Book of the City’s Guests of Honour. The Old Town Hall is Bonn’s front parlour. The foundation stone was laid by Elector Clemens August in 1737 to replace a medieval Gothic building. Designed by Michel Leveilly, the Old Town Hall has a flight of outdoor stairs with golden grating. For 700 years, the site has been a symbol of Bonn’s self-government. It is the permanent venue for the open-air cultural programme called “Bonner Sommer”. The market and the Old Town Hall are open to the public visitors. The town hall is located just behind the University connected by the market lane. 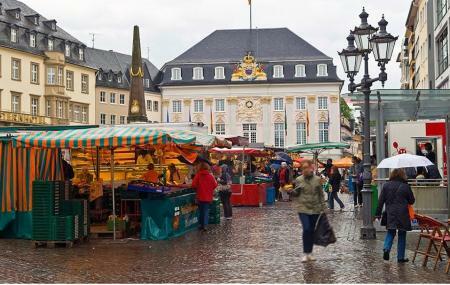 Open discussions are organized at Bonn’s market place. The three-storey building has elevators. How popular is Markt And Old Town Hall? People normally club together Beethoven-Haus Museum and Botanische Garten Der Friedrich-wilhelms-universitat Bonn while planning their visit to Markt And Old Town Hall. A good place to have an afternoon coffee and roam around after school. My favorite is the food truck selling pommes frites. Absolutely gorgeous town hall located on the market off Bonn. On the market you can buy some great food and when it is sunny have a nice cool drink on the terraces. It is easily reachable on foot and bus, tram and metro stops aren't far away.